Mental health care availability and access vary tremendously depending on where you live in the United States. In Massachusetts, for example, there is one mental health care provider for every 180 residents. That ratio is far different in Texas and Alabama, however, where there are more than 1,000 residents for every one provider. 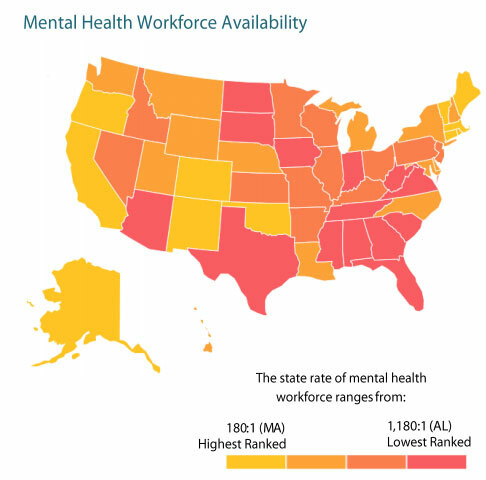 MHA ranked Massachusetts as the best state for mental health care availability, followed by the District of Columbia, Maine, Oregon, Vermont, Oklahoma, New Mexico, Rhode Island, Alaska and Connecticut. All of these states and the District of Columbia have fewer than 300 residents per mental health care provider. On the other end of the spectrum, Alabama (with 1,180 residents for every one provider) and Texas (1,010:1) were the lowest-ranked states, along with West Virginia (890:1), Georgia (830:1), Arizona (820:1), Mississippi and Iowa (760:1), Tennessee (740:1), and Florida and Indiana (700:1). In Oregon, that prevalence was 22.61 percent, followed by Utah (22.27 percent), Kentucky (22.08 percent), Idaho (21.62 percent) and Arkansas (21.02 percent). West Virginia, Vermont, Washington, Montana, Colorado and Alaska followed with rates that were between 20 and 21 percent. 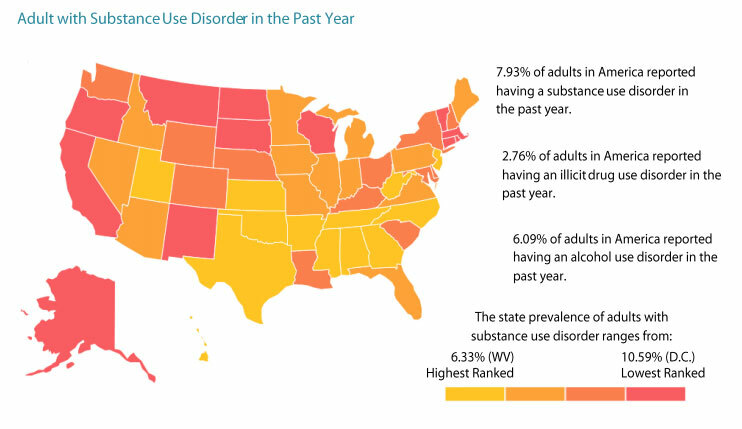 States with the lowest prevalence of adult mental illness included New Jersey (15.5 percent), Hawaii (15.55 percent), Illinois (15.73 percent), Texas (16.04 percent) and Maryland (16.59 percent). North Dakota, California, Florida, Louisiana, Michigan, Mississippi, Arizona, New York, Maine, Delaware, Iowa, Georgia and South Dakota all had rates between 17 and 18 percent. MHA, a Virginia-based nonprofit advocacy organization, compiles a report titled The State of Mental Health in America each year from nationwide survey data, including information from the Substance Abuse and Mental Health Services Administration and the Centers for Disease Control and Prevention. Released this fall, MHA’s current report includes statistics on access to mental health care, uninsured citizens, rates of substance abuse, suicide indicators, youth depression and other factors. 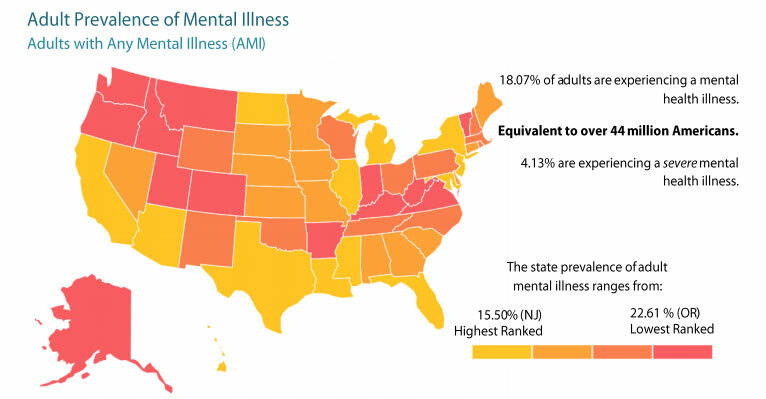 When it comes to mental health, how does your state stack up? If you are reading this article, it is likely because you have a strong interest in counseling. We might even be able to go a step further in saying that you probably love counseling, right? As members of the Chi Sigma Iota (CSI) Counselor Community Engagement Committee, we agree — we love counseling. We also love using components of our professional skills to directly serve the community in ways that go beyond traditional counseling. 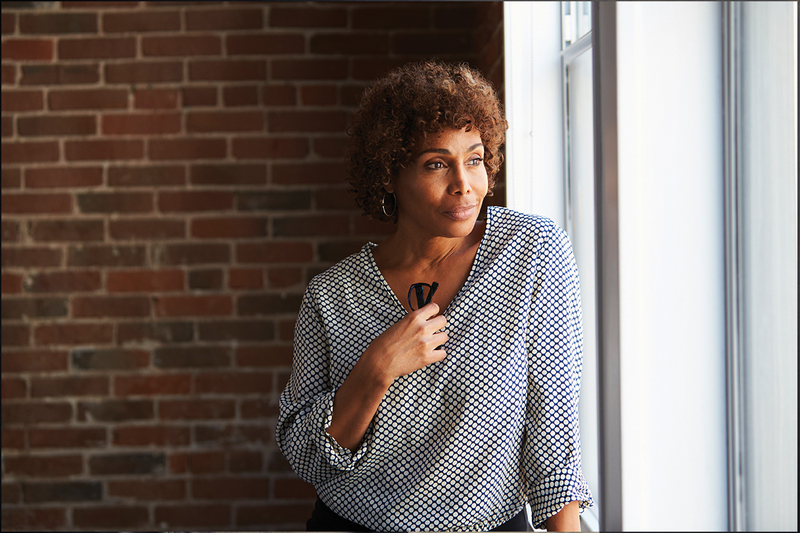 We invite you to take a moment to close your eyes and think back: What was it that influenced your choice to become a counseling professional? Was it your love and compassion for humanity? Was it due to a struggle experienced by someone you love or care about? Was it due to some great injustice that you couldn’t stand any longer? Or was it a talent with which you were born and were fortunate enough to harness through the progression of your life? If you answered “yes” to any or all of these questions, we are in a similar situation. People who come to this field do so because they want to be that change they wish to see in the world. Counselors embody the foundational qualities of empathy, congruence and unconditional positive regard in their everyday lives. Counselors engage with the community in positive ways on a daily basis. Other times, counselors channel more intentional counseling skills in the community when they want to make a difference, and they are willing to make sacrifices if necessary. As individuals who have taken the initiative to earn professional degrees, it is apparent that we possess a desire to make the world a better place. Why else would we spend countless hours and make significant sacrifices to get into a better position to help others? At its core, the role of a counselor is as a helper. That is, our mission is to create a better society, person by person, population by population. As professional counselors, we join with our clients in a relationship to support them toward their mental health and wellness goals. Although we spend the majority of our working hours in session with clients, our professional identities transcend the professional setting. The way we show up in the community is a representation of the counseling profession. We can use our unique skills to support the community in ways that extend beyond the core role of counselor. These roles might include, but are not limited to, advocate, author, community member, educator, gatekeeper, philanthropist, public speaker, researcher and student. The opportunities we have to make the world a better place are seemingly limitless. Those familiar with CSI may be aware of our mission “to promote scholarship, research, professionalism, leadership, advocacy and excellence in counseling, and to recognize high attainment in the pursuit of academic and clinical excellence in the profession of counseling” (csi-net.org). As individuals who love professional counseling, we spend time showing the world how professional counselors make a positive difference in the professional and community settings. Why is counselor community engagement important? Sometimes it can be difficult to remain optimistic when we live in a world where tragedy occurs daily. With our eyes and ears open, we cannot hide from it. From one side of the world to the other, people are negatively affected by racial oppression, sexual inequality, homophobia, homicide, genocide, school shootings, suicide, war, civil unrest, political divide, poverty, homelessness, starvation, slavery, human trafficking, drug trafficking, natural disasters, human-caused disasters and personal relationship difficulties. As we think back on our lives, each of us can recall situations in which we, or someone close to us, were personally affected by incidents that really struck a chord with us — incidents that seemed not right, unfair or downright horrific. But what can be done? The decision to respond or not to respond is one that involves several considerations. After all, as counselors, we spend our working hours helping others, and we do need some time off from work. However, people often choose not to respond because they think they cannot possibly make a difference. “How can I, as one person, stop racial oppression?” Sometimes, the decision to not respond comes from a lack of resources. “I don’t have the time.” “I don’t have the money.” “I don’t have the education or skills.” Sometimes, we don’t respond because we worry what others will think of us. “If I speak out on behalf of the LGBTQ population, will other people think that I’m gay?” Other times, the decision is in line with the phenomenon of the bystander effect. “Other people are already there who will help.” Sometimes, it comes down to us not seeing something as being our personal responsibility or business. “Well, nothing bad is happening in my neighborhood, but if it did, I would certainly intervene then.” Although the reasons not to respond are many, a lack of response always leads to the same result: continued injustice. Then there are those who, for whatever reason, choose to respond. Whether personally affected, vicariously impacted or just wanting to do what is right for humankind, these individuals intervene to help in whatever way possible, regardless of how big or small. If you can find a small amount of energy to devote to something you view as important, you will make the world a better place. As professional counselors, it is our ethical duty and obligation to respond to the American Counseling Association’s call in the Advocacy Competencies (2003) in the areas of client/student empowerment, client/student advocacy, community collaboration, systems advocacy, public information and social/political advocacy. Accordingly, it is the purpose of counselor community engagement to serve those populations that need our help, even if that help extends beyond the core role of professional counselors and into those additional roles as advocates, educators, fundraisers and public speakers. After all, we possess the transferable skills, resources and desire to help. So, we should do just that when we can. The question is where do we begin? We start with an idea. But what use is a great idea if it remains unpursued? The truth is that it is of no use. Sometimes, a fair idea with solid implementation is what can make all the difference in the world. The difference, then, is in the execution. With this general progression of needs assessment, action plan, direct service, evaluation process and identification of new needs, CSI has devised a 10-step method to counselor community engagement that any organization can easily follow. 1) Working together: How can I or my organization work with others to promote meaningful counselor community engagement? Counselors intentionally approach community engagement of all forms in the spirit of cooperation and service. Counselors assume a servant leadership role when out in the community and especially when engaging in a specific community engagement activity. Working together is a crucial element of community engagement activities, and it is important to mention on its own as a foundational attitude for the other considerations. Cooperation and collaboration provide a foundation for conducting initial needs assessments and promoting change within communities. We can work with others by leading, partnering or joining. Simply by reaching out, we may receive the assistance we need to take what was once an idea and turn it into something successful. 2) Level of counselor community engagement outreach: At what level of outreach should I or my organization engage our community? On the organizational level, it is quite natural to get stuck thinking on the microsystem level: “What can we do to help this organization?” With that logic, all thoughts and actions focus only on what the organization and its members can do within the organization to sustain it. However, by moving beyond the microsystem and working with and for others, much more work can be done than was ever thought possible. Levels of counselor community engagement outreach might include local programs, national outreach and international outreach. Reaching out is much easier than one might think. A simple email or phone call or attendance at a meeting might create the spark for a meaningful networking opportunity. Even in terms of national and international outreach, opportunities are much less intimidating and more practical than they may at first seem. At these levels, emails and phone calls still work, but taking the time to attend a larger national or international conference allows for face-to-face, personal connection. 3) Issue areas: What community areas or issues should I or my organization focus on? Is there a certain social injustice I have noticed? What issues are a concern to our community and larger world? How do we benefit the most people? Considerations such as these are important for beginning any type of effort. As we look around us — watching the news on TV, reading updates online, listening to the radio — we will see more and more need for our assistance. 4) Populations served: With whom should I or my organization engage? This question varies significantly from one organization to the next. Those you engage will depend on the need you are attempting to fulfill, the population you intend to serve and the resources you have available, among other factors. Many people could benefit from the caring efforts of a citizen who also happens to be a professional counselor. Think outside the box and remember that every individual experiences his or her own unique struggles. Anyone who is open to help might benefit from counselor community engagement. 5) Community partners: Who else might be an important partner in my or my organization’s counselor community engagement efforts? A partner may be defined as “a person who takes part in an undertaking with another or others.” A partnership can be something that is either temporary or long term. Collaborating with various organizations can maximize the effectiveness of counselor community engagement efforts. Those of you who attended the American Counseling Association Conference & Expo in Montréal in 2016 witnessed a partnership between ACA and the Canadian Counselling and Psychotherapy Association. Through this partnership, the two associations were able to merge the talents of counselors from multiple countries to further strengthen the diversity and quality of presentations, networking opportunities and other efforts. may significantly benefit from that endeavor themselves. Forming partnerships is much simpler than you might think, but it always requires the first action step of reaching out. At this point, readers have likely noticed a similar theme among several of the key considerations for counselor community engagement: working with others to foster positive community change. Many individuals wish to make the world a better place. So, take a step back, think about the bigger picture, and connect with people who might wish to promote a similar mission. 6) Activities: What kinds of activities could I or my organization take part in to engage our community? These activities may include providing or organizing presentations, workshops, keynotes, continuing education, exam preparation, donations, fundraisers, sporting events, benefits, food drives, blood drives, scholarships, awareness events, conferences, free or low-cost counseling, group counseling, psychoeducational groups, awareness presentations, advocacy events, grant writing, tutoring or mentorship. Other engagement activities could involve planting trees, picking up waste, making meals, working at a food bank and so on. Counselor community engagement activities come in all sizes and shapes. The benefits of producing one giant event will not necessarily outweigh the benefits of holding multiple smaller events throughout the year. It is important to consider the weight that “meaning” carries with every event in which your organization engages. Meaning will differ from one organization to the next. Whereas one organization might find raising $500 a relatively modest accomplishment, it could hold significant meaning for another organization. For example, it might represent the first major fundraiser the organization has ever undertaken and successfully accomplished. Or perhaps meaning is not based on the amount of money raised at all but rather on the purpose for which it was raised. In this respect, meaning might be tied strongly to a sense of accomplishment, advocacy, an increase of awareness, the building of morale, the strengthening of membership or some other factor. 7) Advocacy: What might it mean for me or my organization to advocate? 8) Frequency: How often should I or my organization take part in counselor community engagement activities? As with any other key consideration, it is important to be strategic when planning the frequency of counselor community engagement activities. For example, an organization might consider hosting a one-time service event to raise money for families affected by the tragedy of a school shooting. Another organization might consider organizing ongoing counselor community engagement events to educate the public on topics such as bullying, gun laws, screening and peaceful intervention. In either case, the effort expended would be significant, so organizations are encouraged to take strategic action toward engagement activities that they believe will be most purposeful. 9) Action planning/program development: How might I or my organization plan and develop counselor community engagement activities? Adequate planning and preparation will include meeting with stakeholders and setting goals with measurable objectives. For instance, multiple hurricanes tend to impact various regions of the United States each year. Action planning entails first reaching out to impacted areas and seeing how we may assist. Once needs are assessed, we can then meet with those stakeholders to develop an action plan around the goals we hope to accomplish. These goals might include performing community outreach, donating time, fundraising and so on. 10) Evaluation: How did the counselor community engagement activity impact the community and those who engaged in the project? Many factors contribute to the success or failure of a counselor community engagement activity. Without investigating the various components of the activity, it is difficult to gauge whether it is worth conducting again or whether improvements are needed. To increase efficacy, there needs to be some indication of what works. Otherwise, organizations may continue spending resources on something that is fruitless or even harmful. Therefore, it is essential to always conduct some type of evaluation after each counselor community engagement activity. It is our hope that you have found this article helpful for planning, implementing, maintaining and evaluating your counselor community engagement activities. With a bit of effort and intention, we can achieve much more together, thus fulfilling the mission of ACA, CSI and the counseling profession as a whole. Now it is time for you to help change the world. Matt Glowiak is core clinical faculty at Southern New Hampshire University as well as co-clinical director and co-founder of counseling speaks in Chicago, Park Ridge and Lake Forest, Illinois. He currently chairs the Chi Sigma Iota (CSI) International Counselor Community Engagement Committee. Contact him at m.glowiak@snhu.edu. Nicole A. Stargell is an assistant professor in the Department of Counseling at the University of North Carolina at Pembroke, where she serves as the clinical mental health counseling field placement coordinator and the counseling programs testing coordinator. She is also the chapter faculty adviser of the Phi Sigma Chapter of CSI. Contact her at nastargell@gmail.com. 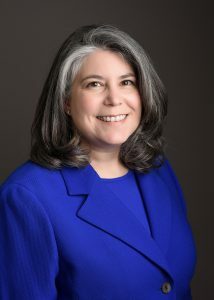 Devon E. Romero is an assistant professor in the Department of Counseling at the University of Texas at San Antonio. Contact her at devon.romero@utsa.edu. A few years ago, while teaching a course in family therapy, a particularly bright and insightful student named Maria lingered after class one day and asked, “Isn’t differentiation of self similar to mindfulness?” I hadn’t quite thought of it like that before, but it certainly seemed plausible. “Let’s set aside some time to talk,” I suggested. With that single question began many months of conversations. In 2015, a continuation of those hours of exploration transformed into an “anti-presentation” that was awarded “Best of Show” at the Louisiana Counseling Association Annual Conference. The examination continued the following spring at the American Counseling Association Conference & Expo in Montréal. In the end, it was inquiry rather than answers that animated our informal lyceum. Quest and question are born of a common root. And teaching is thin soup if only the student grows. The current work is an attempt to extend the spirit and tone of those many fruitful hours of meeting. 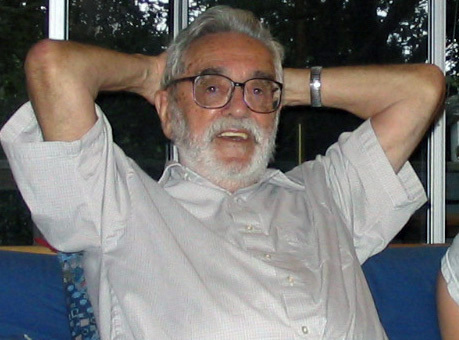 Differentiation of self (DoS), since first being introduced by Murray Bowen in the early years of the family therapy movement, has remained a lofty, elusive and often misunderstood concept. As Bowen’s colleague, Michael Kerr, pointed out, differentiation contains so many unique conceptual facets that it defies simple definition. Bowen himself, persistently mystified by the consistent misinterpretation of differentiation, noted late in his life in one of his more cantankerous moments that he wished he’d never “discovered” it in the first place. Anthropologist Gregory Bateson once said of Charles Darwin that he didn’t discover evolution, he made it up. The same may be said of DoS. Viewed through this lens, DoS becomes a story (the point of which is to communicate its creator’s intent) steeped in a deep faith in science and the relatively recent emergence of the Western nuclear family. If we are to accept the premise that differentiation does indeed defy simple definition, or at the very least is so subtle and nuanced that it is open to numerous interpretations, the initial question that emerges is: What in the world are we actually talking about when we talk about differentiation? Michael Cowen, one of my colleagues at Loyola University New Orleans, provides a useful foundation from which to launch this conceptual ship with his interpretation of differentiation as “the capacity to be aware of one’s own unique pattern of feeling, valuing and thinking, and to decide and act in ways that remain faithful to that awareness.” Cowen’s definition shifts the focus of differentiation away from some thing that one is or has or even does, toward a description of understanding and action. It is a process that, at its core, allows individuals to make distinctions between thoughts and feelings and to remain calm in highly emotional situations. It is the ability to be both a part of and apart from significant relationships, and it places a high premium on the ability to behave rationally. It is not, however, a call for a Spock-like hyper-rationality nor a ringing endorsement of the ruggedly individualistic American mythology. For the sake of moving forward with consensus, nebulous as it may be, I (Kevin) am inclined to give Bowen the final say in the construction of a working definition of differentiation as “a way of thinking that translates into a way of being.” So the story goes. If that description of differentiation is to be accepted, the question then becomes, how is one to cultivate such “a way of thinking?” And who might act as a reliable translator? This is the point at which the teaching of the Buddha, in general, and mindfulness, specifically, can offer a helpful perspective from which to view perceptions and human experience. At first glance, Bowen and Buddha may seem to be a strange pairing. After all, Bowen’s search for understanding led him back to the tumult of his family of origin, whereas Buddha left home seeking transcendence and never returned. Logistically, Buddha’s eightfold path provides a different road map toward liberation and understanding than does Bowen’s eight interlocking theoretical concepts. But the wisdom gained beneath the Bodhi tree may not be as divergent from the family tree as one might think. When differentiation is examined through the prism of mindfulness, significant conceptual convergences begin to emerge. The potential implications for personal growth, insight and clinical practice merit a pause, perhaps a deep breath, and further contemplation. Mindfulness is essentially the act of being present. Anchored in continuous awareness of each emerging moment, it is the cultivation of a calm, dispassionate state in which experience can be examined with acceptance and nonjudgment. Mindfulness, not unlike DoS, is a process that provides the possibility of escaping the trappings of emotional reactivity. In other words, we are able to stay tethered in the present, experiencing our life with courage and composure as it actually unfolds in our midst. In this awakened state, our mind is freed from anger, attachment to desire and misperception. Providing an alternative to being swept away in a flood of emotionality and elaborate misinterpretation, we are able to resist the urge to flee into ideations of the imagined future clouded by the residue of the past, or compulsively bend reality to meet idiosyncratic needs. Mindfulness is the antidote to fear, confusion and anxiety. It is a practice and process that tethers us to the immediacy of our lives with the insight to see “relationships between thoughts, feelings and actions and to discern the meaning and causes of experience and behavior” (as described in “Mindfulness: A Proposed Operational Definition”). Essentially, mindfulness cultivates the ability to interact rather than react. The greatest hurdle in defining a self or sustaining mindful attention is emotional reactivity. When emotions escalate beyond a critical threshold, a state of mind emerges in which rational thinking evaporates and agitation hijacks the cognitive process. It is impossible to differentiate in such an agitated state. We become prisoners to automatic emotional responses saturated in fear. Buddha referred to this reactive state as “monkey mind,” in which fear becomes much like a loud, drunken monkey frantically screeching the alarm bells of danger in our brains. The ability to quickly regain composure and quiet the monkey mind is the cornerstone of both differentiation and mindfulness. The quiet mind is fertile ground for exploring what Buddha called “store consciousness.” Long before Sigmund Freud proposed his theory of the unconscious (again, see Bateson above) or Bowen began his examination of psychobiological cognitive-emotional processes, Buddha was wandering about preaching the Dharma, teaching practices aimed at liberating people from misperception and attachment to mental formations that seemed to be just beyond the reach of everyday awareness. Whatever we “attend” to will grow. And what we don’t attend to will tend to grow out of control without insight into content and coping strategies buried deep in our store consciousness. For multigenerational family systems theory, the seeds in the soil are the early experiences in the family of origin. Differentiation allows for a bit of psychic “weeding” to occur so that intimacy and integrity may grow. The well-differentiated self exhibits radical acceptance to what Jon Kabat-Zinn calls the “full catastrophe of living.” In this way, we remain open and curious to the actual events of our lives as they unfold, freeing ourselves from endless cycles of suffering and automatic reactivity. Whether we call this mindfulness or differentiation becomes an exercise in semantics. Through work and practice, we become available to the full reality of our lives, with the insight and courage to quietly slip through the cracks of our conditioning and allow our ego-cramped consciousness to release its grip on our battered psyche. Quite simply, DoS and mindfulness bring us back into harmony with our lives. For Buddha, the ultimate act of enlightenment is to wake up. The Dharma teaches that it is possible for any of us to awaken at any moment in our lives. Much like achieving a fully mindful present state, people often find embarking on the path of defining a self to be a daunting task. Bowen was clear and consistent in his insistence that the fully differentiated self is a theoretical concept that is practically unattainable. It is a guiding light rather than prescription. However, with much work and practice, it is possible to increase one’s level of differentiation. Bowen pointed out that if we can “control the anxiety and the reactiveness to anxiety, the functional level will improve.” The task at hand becomes “getting beyond anger and blaming to a level of objectivity that is far more than an intellectual activity. … The overall goal is to be constantly in contact” with emotional issues involving ourselves and others. Although Bowen and Buddha’s conceptualization of the “self” superficially seems to be the point at which the Venn in the Zen between DoS and mindfulness begins to diverge, it is through interdependence that the deepest synthesis actually occurs. Whether one adopts a scientific or a spiritual perspective, the influence that each of us has upon the other is the thread that ties mindfulness and differentiation together. Both Buddha’s and Bowen’s philosophical views were undergirded by a belief in the profound effect that each of us has upon one another. Bowen believed that successfully differentiating oneself within the system could have significant influence on all others in that system. He noted that if one is able to successfully define a solid sense of self and defend against requests from others to change back to old ways of being, then the entire system can catapult forward into higher levels of functioning. These are hopeful thoughts for troubled times. What is called for in this moment, if one is to view differentiation through the lens of mindfulness, is a “way of thinking that translates into a way of being in the world” that accurately perceives the deep connection that we have with the world surrounding us and the profound effect that each of us has upon one another. So the story goes. Counseling is a reciprocal process of story and interpretation. As a conversational intervention, much attention has been given to the narrative telling of the tale — the “talk” in talk therapy. Often lost in the reciprocity is the transformative power of listening. As Hanh points out, when we listen to another deeply and compassionately, we help that person to suffer less. “One hour like that can bring transformation and healing,” he teaches. If listening in this way does indeed, as we believe, lead to the alleviation of suffering, the question becomes, how does one engage in the process of compassionate listening? The calm that accompanies the differentiated self, and a mindful stance tethered in the present, provide a helpful perspective from which to enter into another’s story. It allows one to avoid judgment without abandoning discernment and concern. This way of being allows the counselor to bear witness to the tumultuous content of clients’ troubled narratives without becoming overwhelmed. We can tolerate intense emotion without needing to flee for safety and care without getting carried away. Deep listening contains the seeds of empathy. The calm that accompanies a well-differentiated presence opens up the space to create the distance necessary to examine problem-saturated narratives. The practice of active listening artfully folds the story continuously back upon itself, returning the client to present-moment awareness. The acceptance that accompanies awareness invites the client to slow down, resist the impulse to avoid the suffering and instead examine the story with compassion. The wisdom to accept that which is beyond our control paradoxically generates the flexibility necessary for transformation to occur. Pragmatically speaking, compassionate listening is rooted in language. To listen in this manner, it is essential to remain firmly planted in the present, gathering content without getting lost in the labyrinth of past suffering or anxious projections of the future. When listening to stories of suffering, it can be easy to lose sight of the fact that the actual experience is the retelling of the tale here and now, not what occurred there and then. It is imperative to honor our clients’ suffering while also uncovering their strength. The task is to attend to the content of the client’s story while staying deeply connected to the person. Listening in this way allows us to wonder what the client is trying to communicate about his or her struggle through the story. What meaning is seeking to be understood? What are the relational and emotional elements recurring in the client’s words? Compassionate listening is the conduit into the deepest sense of clients’ experiences. It asks, how can we be present to the struggle and help our clients confront the frustrating and most frightening moments of their lives? At its core, compassionate listening holds the therapeutic space. It widens the client’s interpretation just a bit. It uses the client’s language, symbols and metaphors. It sees as well as hears, deconstructing the story, searching the margins for what has been edited out, pulling the thread of seemingly disjointed pieces and reflecting it back in recognizable form. This way of listening is ultimately a path toward healing that allows for safe passage through suffering. As American Buddhist nun Pema Chödrön points out, mindfulness allows us to choose an alternative course for our lives. A process such as DoS requires us to first notice the true nature of our experience, then disrupt our habitual patterns and do things differently and, finally, practice again and again, one moment at a time. A client suffers and a change is necessary. The struggle often comes with not knowing how to manifest a healthy change. The client has likely been avoiding, wrestling with and running away from anxiety for years, creating deeply ingrained habits. In the space created by deep listening, the client can experience something different. Clients may be able to look at their anxiety for the first time with compassion and understanding. The paradox is that once they are able to sit with their struggle instead of avoiding it, anxiety loosens its grip on their lives. 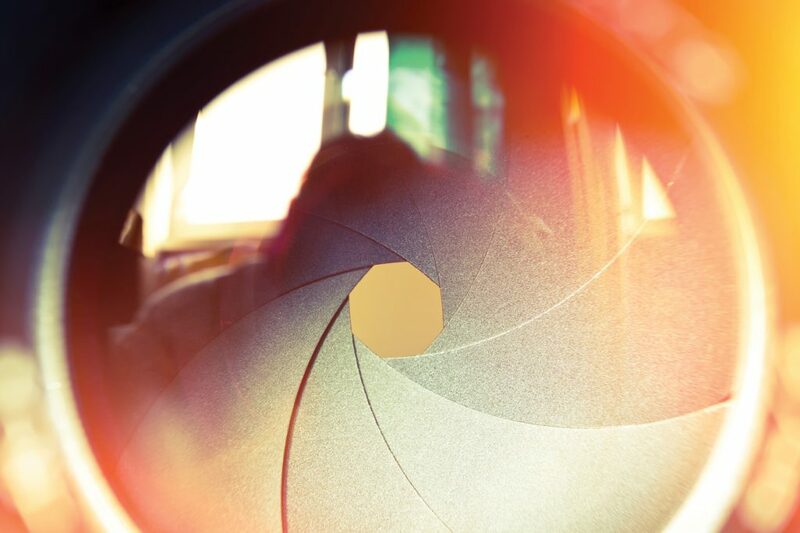 DoS, viewed through the lens of mindfulness, creates the clarity and compassion for transformation to occur. Mindfulness aids in the process by creating awareness of our mind-body interaction so that we can become more skillful in our interpersonal, and intrapersonal, relationship(s). Just as the counseling process makes space for emotions, thoughts, ideas and stories in session, mindfulness creates a similar space for our internal experience to occur. This is the “deep listening” to our own process. Mindful awareness allows for attunement, not only with our clients but with ourselves. It creates systemic and intrapsychic awareness to the ways that we get hooked into metanarratives and mental confines. Emotions no longer run amok, and we are available to be in relationship with others. As clinicians, we must first listen deeply to the mystery and history of our own stories before making contact with someone else’s. 1. Get enough food to eat,/ and eat it. 2. Find a place to sleep where it is quiet,/ and sleep there. 3. Reduce intellectual and emotional noise/ until you arrive at the silence of yourself,/ and listen to it. Kevin Foose is an assistant professor in the Department of Counseling at Loyola University New Orleans. He maintains a private practice that focuses on couples and adult individuals. Contact him at kjfoose@loyno.edu. Maria Cicio is a graduate of the Loyola University New Orleans master’s in counseling program, class of 2015. A licensed professional counselor, she is currently working in community mental health in rural Oklahoma.